9ct Gold Oval Shaped Tanzanite And Diamond Trilogy Stone Ring. 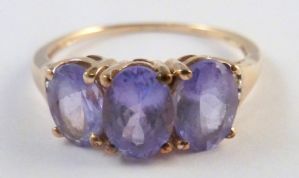 Stunning 9ct gold oval tanzanite, diamond set trilogy ring. 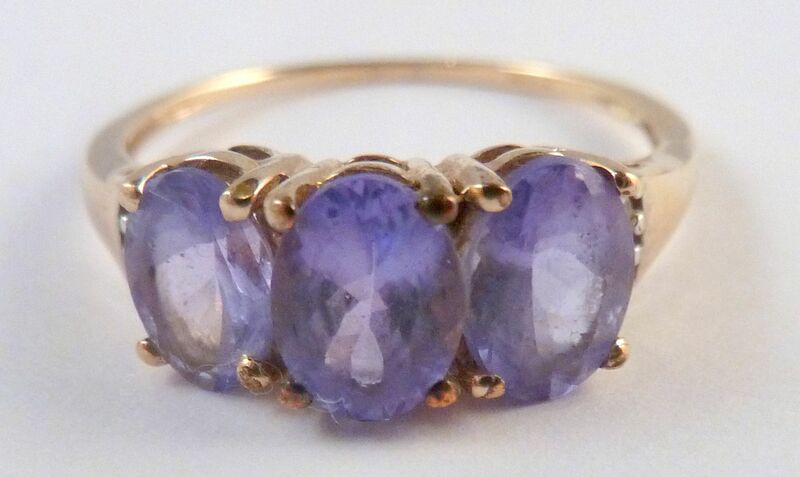 UK size R.
9ct gold, oval shaped, three stone tanzanite and diamond ring. Featuring three raised oval shaped tanzanite stones, flanked by six diamonds, three set each side. The ring is Hallmarked for 9ct gold, Birmingham with the makers mark CR. The ring is a UK Size R, US size 8 3/4. Ring Size UK R , US 8 3/4. 9ct gold, tanzanite and diamond. Hallmarked for Birmingham, 9ct gold, 2012 to the inner band of the ring, with makers mark CR. A stunning, modern 9ct gold, tanzanite and diamond trilogy ring.